Today was fun. So fun that I'm writing about it right before I end the day so I don't forget. We headed to King Edward VII Lower School for SMG. I became a ball magnet. A basketball bounced off my head caused by a guy who sings really well! He even held out his hand to rub my head but then retracted it. (insert sad face) I then went around the venue where I saw a frozen Hannah and Azri who thought I came to support him. I proceeded to cheer for Sani because who is Azri again? It was in the football pitch that I was then hit in the shin with a football. Some time during the day, a ping pong ball just somehow decided to fly at me. As I was walking back to the main venue, Zubair called me from the court and I told him that I would meet him at the food place. Only problem was that his phone died so we ended up not being able to meet up at all! I had lunch with Fauzan and found a guy who seemed interested in SKY. Knowing that I wouldn't be able to attract him well enough, I got Syafiq to explain what SKY is to him. Quality over quantity. I also crossed path with my group mate from EYH but I was just too shy to tegur him. The regret is real. 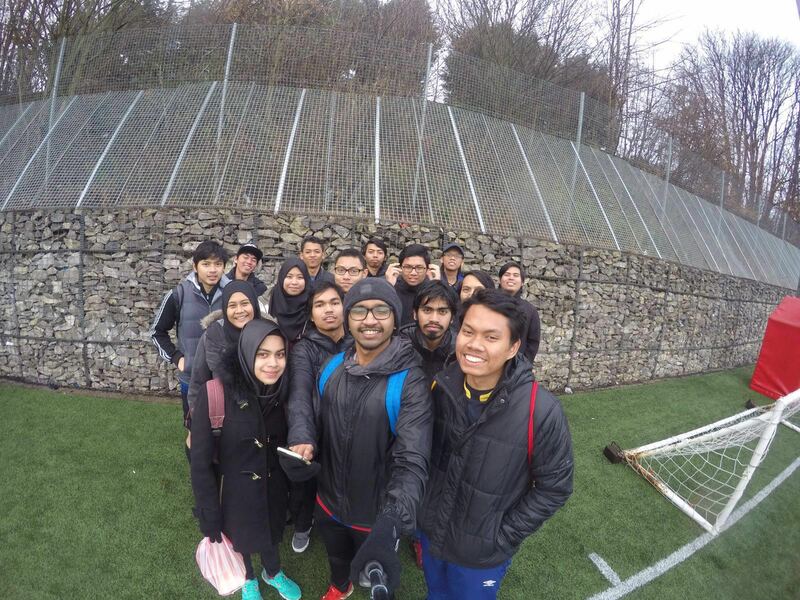 I met up with Nazhif as well who came to play football. His whole team was very very very very nice! As I was walking around the venue, I bumped into Fatimah and also saw this guy whom I met in London (Asyraf Said's friend) but I was also too shy to tegur him. I had nasi kandar, 5 popias, a samosa and cendol. Nom nom nom. Cendol was so good. I would've bought 10 but it was £3 each. Caught up with Aiman who I haven't seen in ages! Went back home with Itik and hung out with him while finishing the food that everyone brought home with them. Had dinner at the other house... fried chicken and chips. Ubai was saying something about a university finding a cure for something. He was being very critical about it and that was when I realised how my thoughts are still immature. Fauzan then came (the guy clearly has too much time in his hands) and we hung out in the kitchen with Hannah and Amir. The guys in the living room were playing the "Bang bang bang, siapa mati?" game. I obviously had to go to the kitchen and get that thing going around. Ended up realising that the concept was different. Stayed til around 12.30am playing really random puzzles lead by Acap. It was annoyingly fun. Tomorrow's plan is to go on a picnic. Hoping that it won't rain!